J Street New York area field organizer Amy Levin addresses the crowd. J Street's new regional field organizer urged local followers to seize on current headlines to push for a two-state solution to the Israeli-Palestinian conflict. 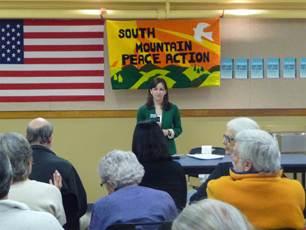 Amy Levin's May 1 appearance at Maplewood Memorial Library on behalf of the "pro-Israel, pro-peace" group came during a week in which the Arab League endorsed a Middle East peace plan allowing for agreed-upon land swaps. "Your timing is kind of amazing. In the last two days, there has been a sea change in the Palestinian-Israeli peace process," said Paul Surovell, chair of South Mountain Peace Action, which hosted her talk. "Last week, the two-state solution appeared to be dead; today it is more alive than ever." Levin, who lives in Brooklyn and is based in New York, called on those present -- about 40 people, most of them Jewish -- to press for the renewal of the two-state process. "Change comes from the ground up," she said. "Don't be afraid to speak out." In her talk, Levin stressed the importance of "engaging with those whom you disagree with" and conducting a "vibrant but respectful debate" with regard to Israel. "Strong and vibrant debate has characterized the Jewish tradition for millennia," she said. "That's why we believe it is necessary to engage with those with whom we disagree. We're bringing more pro-Israel, pro-peace activists into the community." "I know that many of you are here because you are committed to peace, in all of its forms and contexts," she said. "Let's not stay silent when our president is calling on us to take action. Change, he said, lies in the hands of the people, especially young people."